Summary: Hinduism has one of the richest sacred literature. Some of its sacred texts have a history of a few thousand years. Many ancillary texts also played an important role in its development. In this essay we examine the importance of ancillary sacred literature of Hinduism namely the Puranas, Vedangas, Darshanas, the epics Ramayana and Mahabharata, Bhagavadgita, Sutras, devotional literature, Agamas and the Tantras. Hinduism has drawn richly from several literary sources. The Vedas are the most important among them. They form the core of Hindu ritual and spiritual knowledge, beliefs and practices. Other important texts of the Vedic period include six ancillary texts or limbs of the Vedas (Vedangas) and four texts or aphorisms (sutras). In the following discussion we will examine the secondary texts which contribute to our knowledge of Hinduism. The Vedangas, meaning the limbs of the Vedas, are the ancillary texts. They enhance our study and understanding of the Vedas besides preserving and protecting the purity and integrity of their content, structure and expression. They are six namely shiksha (study), chhanda (meter), vyakarna (grammar), nirukta (lexicon), jyotisha (astrology), and kalpa (methodology of rituals). Each of them has a particular value in the ritual practices of Vedism. For example, chhanda helps in the chanting or singing of the Vedic hymns according to the establish metrical rhythm. Nirukta helps in the study of the Sanskrit words and their meaning. Jyotisha helps in the study of the planetary positions and divisions time to determine auspicious time to perform various Vedic rituals. Kalpa helps in preparing and setting the stage for the performance of the rituals. Thus the Vedangas help as aids in the study of the Vedas as well as in the performance of the sacrificial ceremonies by avoiding common mistakes. The Sutra texts establish the rules and procedures for the performance of various, domestic and nondomestic rituals and sacrifices. The four Sutras are the Shrauta Sutras (on how to perform rituals), the Sulba Sutras (on how to build altars), the Grihya Sutras (on how to perform domestic rites) and the Dharma sutras (on how to live virtuously according to one’s dharma). They form part of the Kalpa Sutras. The Grihya and Dharma Sutras are often combined under the generic name Smarta Sutras. The Puranas contain legends, histories of ancient kings, sages, warriors, and royal lineages, cosmogony, cosmology, creation theories, the exploits and adventures of gods and goddesses, intermixed with useful information on the essentials of philosophy, devotional theism, morality and spirituality. They form part of the smriti tradition, and serve an important role in creating and promoting religious awareness, beliefs and practices. They also describe the metaphysical truths regarding creation, and the battles between gods and demons. Although for a student of history they may not represent authentic historic documents, for a student of Hinduism they are a valuable source of information. Hindu tradition recognizes 18 principal (maha) Puranas and 18 ancillary (upa) Puranas. There are multiple recensions for each Puranas, whose authorship is uncertain. They were probably composed by numerous scholars over time. They are further divided into Shaiva, Vaishnava, Agni, Brahma, and Surya Puranas. The main Puranas are the Matsya Purana, Padma Purana, Naradiya Purana, Vishnu Purana, Varaha Purana, Vamana Purana, Brahma Purana, Shiva Purana, Skanda Purana, Markandeya Purana, Garuda Purana, Agni Purana, Linga Purana, Brahmavaivarta Purana, Kurma Purana, Brahmanda Purana, Vayu Purana, and Bhagavata Purana. There is no unanimity about what constitute the 18 ancillary Puranas. A few important Upa Puranas are Vashistha, Devi, Ganesha, Parasara. Bhargava, Varuna, Nandi, Surya, Durvasa, Kapila, Bhargava and Samba Puranas. They are relatively less known than the Maha Puranas and less imporant. The Puranas played a significant role in the transformation of Hinduism, restructuring of the ancient Vedic pantheon and elevating the chief deities, Shiva and Vishnu, who were relatively unknown during the early Vedic period. They synthesized diverse beliefs and practices and facilitated the continuation of the ancient as well contemporary aspects of Hinduism, besides contributing to the rise of popular devotional Hinduism and creating public awareness about the deities and their religious and spiritual significance. Darshana means a vision or a viewpoint. Each darshana represents a particular school of Hindu philosophy, or a perspective of truth or the reality of existence. The Darshanas are six namely the Nyaya, Vaisheshika, Samkhya, Yoga, Mimansa and Vedanta. Of them the last two are also known as Purva and Uttara Mimansa (inquiry) respectively. The six Darshanas are again traditionally paired into three subgroups because of their close association namely Nyaya-Vaisheshika, Samkhya-yoga, and Purva-Uttara Mimnasa. Of them the last two are directly derived from the Vedas. All the schools are considered theistic (astika) because they believe in afterlife and in either God or soul or both. However, except for the Vedanta, the remaining schools do not believe in the existence of a Supreme Being or his role as creator, although they acknowledge the existence of eternal, indestructible, eternal souls. Apart from them, there are other schools which are decidedly atheistic. Prominent among them is the Charvaka school, which formed part of the ancient Lokayata (materialistic) tradition. They did not believe in afterlife or the inviolability of the Vedas or their divine origin. The Darshanas provide an insight into ancient Indian philosophies and their value to Hinduism in understanding its essential concepts, beliefs and practices. They explain the philosophical basis of the main concepts of Hinduism such as the nature of reality, the properties of matter and the objective world, the means to ascertain the truths of existences and the metaphysical truths within the limitations to which we are subject. Our knowledge of Hinduism shall remain incomplete without their study. Each of the Darshanas has its own scriptural basis, teacher traditions and sub schools. The principal texts of the six schools are the Nyaya Sutras of Gautama, the Vaisheshika Sutra of Kanada, the Samkhya Karika of Isvara Krishna, the Yogasutras of Patanjali, the Mimansa Sutra of Jaimini and the Vedanta Sutra of Badarayana. In the post Buddhist era, the Indian subcontinent witnessed the rise of Hindu devotional theism, spearheaded by the followers of both Shaivism and Vaishnavism, which gave birth to a rich corpus of devotional literature. Indeed, it was an offshoot of the Vedas, epics, the Puranas and sectarian literature only. The two major Hindu epics, the Ramayana and the Mahabharata, constitute the Itihasa literature. They are complex stories of a very ancient past about whose antiquity and real historical basis no one can ascertain. They are also the largest and the most ancient epics in the world, interspersed with rich philosophy, veiled history, and the play of gods and God in the affairs of the human beings. As religious works they occupy a special place in the hearts and minds of Hindus. They also gave birth to a rich collection of derivative works, commentaries and interpretations. The epics still capture the imagination of Hindus, who do not get tired even after repeatedly listening to the same stories and incidents. Since ancient times they have been playing a significant role in spreading religious awareness among the masses and strengthening their faith. In many ways, they did a greater service to Hinduism than any other religious text, including the Vedas and the Upanishads. No study of Hinduism is ever complete without their study. The Bhagavadgita forms part of the Mahabharata. 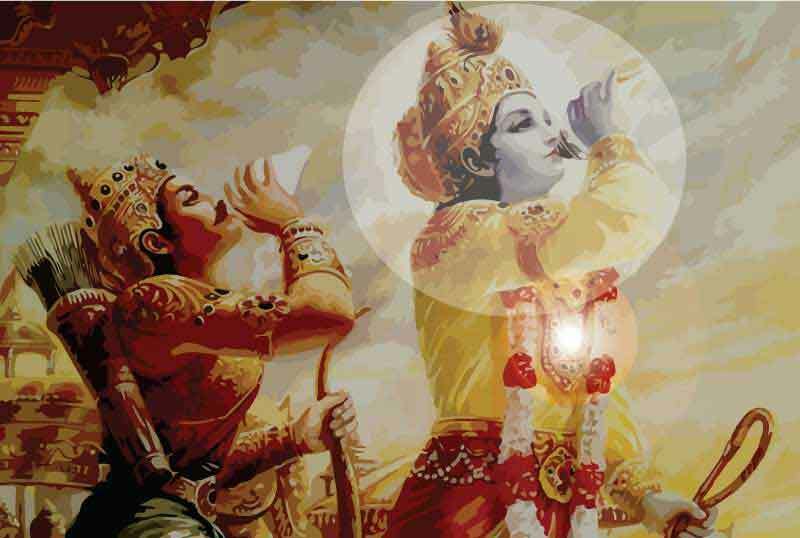 It contains the teachings of Lord Krishna to Arjuna, in the middle of the battlefield, about the meaning of true self, renunciation of desire-ridden actions, the resolution of karma, the realities and modes of Nature, the role of God and his numerous manifestations in creation, divine and demonic qualities, the value of true devotion and surrender to God, the importance of cultivating purity and working for liberation. It contains 600 verses, divided into 18 Chapters of varying lengths, which synthesizes the diverse belief and practices of Hinduism into a harmonious and integrated system of yoga to achieve liberation. The text, which has been translated into almost every major world language, has profoundly influenced many generations of Hindus and continues to play a significant role in molding their lives. Apart from them, there are many other works of devotional value, both in Sanskrit and vernacular languages such as the composition of the Alvars and the Nayanars, and the works of several medieval bhakti saints and spiritual teachers. The scope of this essay does not allow us to specifically mention them. Other principle sacred texts of Hinduism include the Saiva Agamas, which are treatises on the greatness of Lord Shiva and his various aspects, and Vaishnava Samhitas, which deal with the worship of Lord Vishnu and his various forms. There are also many Tantras, which deal with the ritual and spiritual worship of Shakti or Mother Goddess, her numerous power and potencies and the symbolism and spiritual value of the mantras, mandalas, chakras, and sacred syllables. Hinduism was also greatly benefited by the works of latter day scholars such as Shankaracharya, who wrote commentaries on major Upanishads, apart from original works and devotional compositions. According to tradition, he played a significant role in the revival of Hinduism and strengthening its roots at a time when Buddhism was on decline in India. He also expounded Advaita, the philosophy of nondualism, according to which Brahman was the only existential reality, and his creation was a temporary projection or an illusion. Other prominent texts which deserve to be mentioned are the works of Ramanuja, Madhava, the Alvars, Nayanars, Ramananda, Vallabhacharya, Nimbarka, Tulsidas etc. During the British period many scholars and spiritual masters contributed to the renewal and reform of Hinduism through their writings. They tried to use religious beliefs and values which were enshrined in the ancient Hindu sacred texts to inculcate feelings of unity and nationalism among the Indians and unite them against the colonial rule. Prominent among them were Swami Dayananda Saraswathi, Ramakrishna Paramahansa, Swami Vivekanada, Ramana Maharshi, Aurobindo, Yogananda, Rabindranath Tagore, Annie Besant, Balgangadhar Tilak, Mahatma Gandhi and several others. Through their teachings and actions, they inspired millions of Hindus to take pride in their religious heritage and adhere to its eternal values.